The Czech Republic is located in the middle of Eastern Europe. It borders Poland to the northeast, Germany to the north and northwest, Austria to the south, and Slovakia to the southeast. The country was formally known as Czechoslovakia, and decided to end its union with Slovakia on January 1, 1993. 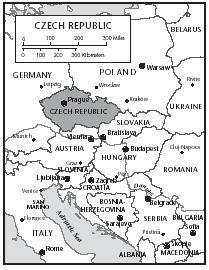 The land of the Czech Republic is made up of two regions. Rolling hills, plains, and plateaus make up the western region of Bohemia. The eastern region of Moravia is very hilly. Czech summers are relatively cool, with temperatures averaging 66 °F. 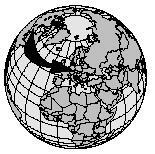 Winters are cold, cloudy, and humid, with temperatures typically around 30°F. Czech cuisine was influenced historically by the surrounding regions that dominated the country. In 1273, Count Rudolph, King of Germany, founded the Hapsburg dynasty. Eventually the dynasty controlled most of Europe, including the region of the present-day Czech Republic. The Germans brought with them roast goose, sauerkraut, and dumplings, which have since become Czech staple dishes. In 1526, Ferdinand I of Austria began his reign as King of Bohemia (a western region in the Czech Republic) and the Hapsburg rule of Central Europe grew. From Vienna, the capital city of Austria, schnitzels (breaded and fried chicken or pork patties) were introduced to the Czechs. Eastern Europe offered such flavorings as sour cream, vinegar, and pickles. Czech cuisine is considered heavy and very filling, with meals centered on meats and starches. This is because Czech winters are long and cold, which does not allow for a variety of fresh vegetables. In fact, if salads are available, they typically are limited to two vegetables, such as tomato and cucumber. Houby (mushrooms) are the exception, which flourish in local forests and are popular in soups, such as houbova polevka myslivecka (Hunter's mushroom soup). Seafood is not widely available because the country is not located by any large bodies of water. The fish, usually carp and trout, are raised in artificial lakes or fish farms. Some Westerners may think eating carp is unappealing, but in the Czech Republic, the water where they are raised is drained clean every year. Add the bacon pieces and fry until crispy. Add the mushrooms and onion and fry until tender, about 4 minutes. Add the flour and stir until the flour begins to brown. Add the water and bring to a boil, then add the bouillon cube. Reduce heat to medium and simmer about 20 minutes, stirring occasionally. Add cream, salt, pepper, and cooking wine (or water). Czechs eat a wide variety of meats, from pork, beef, ryba (fish), and chicken, to duck, hare (similar to a rabbit), and venison (deer meat). The meats are commonly served with knedlíky (dumplings), brambory (potatoes), or rýe (rice), and are covered in a thick sauce. Dumplings are popular side dishes, and are even stuffed with fruit as a dessert. The sauces are thick, like gravy, and are commonly made with wine. Sometimes fruit (such as cherries or berries of some sort), mushrooms, or onions are added for more flavor. Other common flavorings in Czech dishes are caraway seeds, bacon, and salt. In a mixing bowl, combine beaten egg, milk, flour, baking powder, and salt until smooth. Add bread cubes in batter and mix well. Make 2 small balls from the dough. Fill a large pot about half full with water and bring to a boil. Drop the dough balls into the pot of boiling water and cook 10 minutes, then roll knedlíky over and cook an additional 10 minutes. Remove immediately from the water and cut in half to release steam. Serve with roast pork, sauerkraut, or kure na paprice (see recipe below). 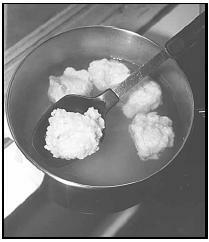 Knedlíky, or dumplings, are made from dough that is boiled in water. Kure Na Paprice (Chicken Paprikas), a favorite Czech dish, is typically served with knedlíky (dumplings). sour cream sauce, with lemon and lingonberries (similar to cranberries). Season chicken with 1 teaspoon paprika, salt and pepper. Heat olive oil in skillet over medium to high heat and sauté chicken on both sides until thoroughly cooked. Set aside. Add butter to skillet. Sauté onion until softened, about 3 to 4 minutes. Add remaining 3 teaspoons paprika and stir. Add chicken broth to mixture and boil until sauce is thickened, about 8 minutes. Place chicken back in skillet. Turn heat down to low and add sour cream, mixing to blend thoroughly. Season with salt and pepper to taste. Heat beans in a large saucepan over medium heat until cooked through, about 3 minutes. Add the water and bring to a boil, then reduce heat to medium. In a frying pan, heat the shortening over medium heat until it melts. Add the beef and onion and fry, about 4 minutes. Season with pepper. Dust the meat with flour and allow it to brown. Add a little water from the beans to the meat and onion mixture to make a paste. Add this mixture to the saucepan of beans. Add tomato sauce and paprika. Simmer for about 20 minutes on low heat. 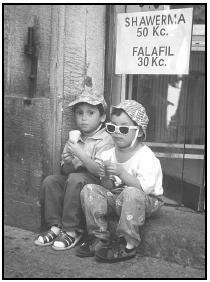 Two Czech children enjoy ice cream, seated on the threshold of a shop advertising two Middle Eastern favorites—shawerma (grilled, skewered meat) and falafil (deep-fried chickpea balls), with prices quoted in Czech currency, the koruny (Kc). More than 80 percent of the Czech Republic population is Christian, either Catholic or Protestant. Two of the biggest religious holidays are Christmas and Easter. Christmas Eve is celebrated on December 24 with a large dinner. According to one of the many Czech Christmas customs and traditions, a bowl of garlic is placed under the dinner table to provide protection to a family. There is an old superstition that if anyone leaves the dinner table early, they will die the following year. As a result, everything is prepared and placed on the table before anyone sits down so no one needs to get up before the meal is finished. The traditional Christmas Eve meal is usually served around 6 P.M. and might include potato salad, soups, cookies, a fruit bread called vánocka , koláce (a type of pastry), and carp. Czechs go fishing for carp before Christmas Eve and usually keep the fish alive in the bathtub until it is ready to be prepared. In a large mixing bowl, combine molasses, shortening, sugar, cinnamon, ginger, baking soda, and salt. Add flour, a little at a time, to form dough. Cover with plastic wrap or foil and refrigerate for at least 4 hours. Divide dough into 4 balls, and keep covered with a damp towel. On a lightly floured surface, roll each ball, one at a time, to about ⅛-inch thick (very thin). Cut into desired shapes using cookie cutters or rim of a glass and place on greased cookie sheet. Bake about 6 minutes, until lightly browned. The food that is prepared for Easter dinner is usually taken to Mass on Easter Sunday, where it is placed on the altar and blessed by the priests. The blessed food is then taken home to be eaten. A traditional Easter dinner may include baked ham or lamb, polevka z jarnich bylinvelikonocni (Easter soup), made of different herbs and egg, and a loaf of sweet bread called mazanec, made with raisins and almonds. A typical snídane (breakfast) in a Czech home is hearty–bread with butter, cheese, eggs, ham or sausage, jam or yogurt, and coffee or tea. For a quick breakfast, a Bohemian koláce (pastry) topped with poppy seeds, cottage cheese, or plum jam may be bought at a bakery. Add the shredded cheese and salt. Arrange the bread slices on a cookie sheet. Cover the bread slices evenly with the egg and cheese mixture. In a frying pan, heat the oil on medium heat. With a pancake turner or spatula, pick up the bread slices one at a time and flip them mixture down, into the oil. Fry the bread about 2 minutes, or until the eggs are cooked. Be careful not to burn. When ready to serve, sprinkle with paprika. Serve immediately. Obed (lunch) is the main meal of the day for Czechs, where dinner may be no more than a cold plate of meats or cheese, such as mala sousta se syre ("small cheese bites"), and condiments. Obed is eaten between 11 A.M. and 1 P.M. Popular dishes may include gulás (goulash), svícková , roast beef in a creamy sauce topped with lemon and lingonberries (similar to cranberries), smazený syr (fried cheese), or smázené zampiony (fried mushrooms). Mala Sousta Se Syre (Small Cheese Bites), slices of cucumber, cubes of cheese, topped with fruit, may be served as a snack or a light supper. Place a slice of cheese on each slice of cucumber. 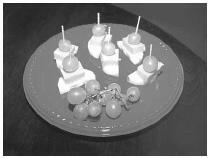 Pin a piece of tangerine or grape on top with a toothpick. Travelers may stop at a street stand and buy a párek (hotdog), klobása (spicy sausage), or hamburgery , which are not like Western hamburgers. A hamburgery is ground pork (not beef) with sauerkraut, mustard, and ketchup on a bun. Stands also sell Middle Eastern specialties such as falafil (deep-fried chickpea balls) and shawerma (grilled, skewered meat). Open-faced sandwiches called oblozené chlebícky are also popular, which are commonly made with cold meat, eggs, cheese, or mayonnaise-based salads, such as ham and pea, or potato. Sandwiches may be eaten with soups, such as rajska (tomato and rice), polevka jatrovymi knedlicky (soup with liver dumplings), or polevka z hlavkoveho zeli s parkem (cabbage soup with frankfurters). Czech beer has been produced since the 1000s, and is considered some of the best in the world. Adults usually drink it at every meal, sometimes even at breakfast. If there is room at the end of a meal, desserts such as palacinky , rolled crepes filled with jam, fruit, or topped with chocolate sauce, or jablkový závin (apple strudel) may be served. Czechs prepare their foods in the kitchen and bring out the plates to the table. The head of the household or the guests are served first. The Czechs use their eating utensils to eat their meals. The nuz (knife) and vidlicka (fork) are kept in their hands throughout the meal and left crossed on the table to show that they are not finished eating. In many families, conversation while eating is minimal, unless there are guests. It is considered polite for a guest to bring inexpensive gifts to the children of a host. The Czechs have very few nutritional problems. Free assistance and care provided to women and children have resulted in a low infant mortality rate (number of infant deaths) of 7 per 1,000 live births in 1999. All school children are provided with medical attention, including X rays, and annual examinations. In 1997, children up to one year old were immunized for a number of diseases, including tetanus, and measles. Czech and Slovak Republics . Melbourne, Oakland, CA: Lonely Planet Publications, 1998. Martin, Pat. Czechoslovak Culture: Recipes, History and Folk Arts . Iowa City, Iowa: Penfield Press, 1989. Trnka, Peter. The Best of Czech Cooking. New York, NY: Hippocrene Books, 1996. Diana's Gourmet Corner. [Online] Available http://belgourmet.com/cooking/links/cze.html (accessed April 17, 2001). Locallingo.com. [Online] Available http://www.locallingo.com/countries/czech_republic/culture/easter.html (accessed April 17, 2001). The Prague Post. [Online] Available http://www.praguepost.cz/tourist/tourfood.html (accessed April 17, 2001). Radio Czech. [Online] Available http://www.radio.cz/christmas/customs.html (accessed April 17, 2001).